OPEN STUDIO. It’s always a privilege to enter an artist’s studio. Art books on a corner shelf give clues about their influences. Photo albums containing mini-prints of the their previous works and scrap books containing invitations and news clippings of their past shows tell stories about their artistic journey. As the artist speaks animatedly about every unfinished and yet unsigned artwork in the studio, we are drawn to their openness for sharing the creative process behind their coveted masterpieces. 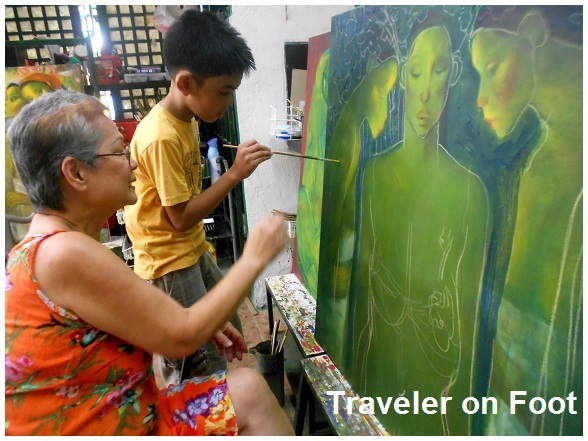 This openness is particularly vibrant in artist Alexander Jorge ‘Aljo’ Pingol. A RELIC FROM CUBAO. 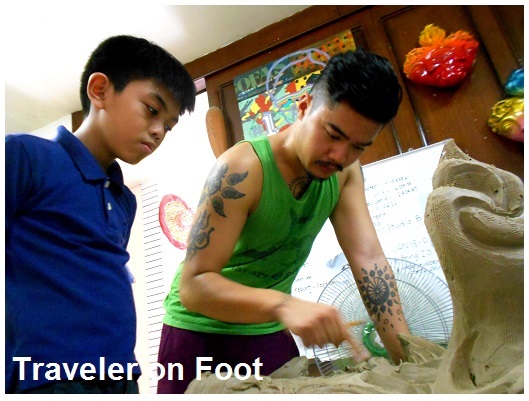 One Saturday we met Aljo and his family in Valenzuela City. 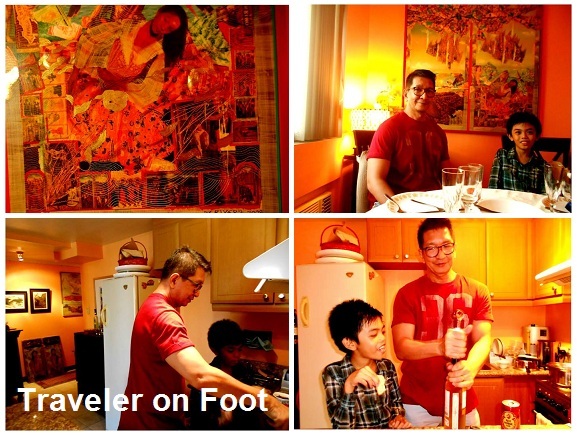 We brought with us the table top from Joaquin’s study table where Aljo agreed to paint his art on it. 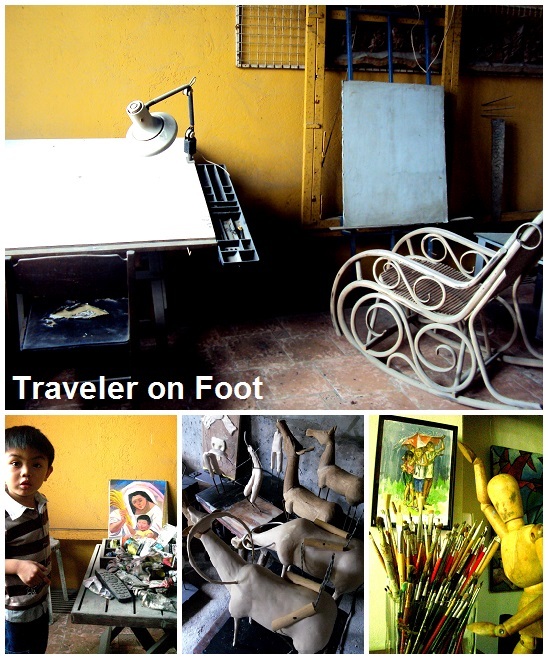 After lunch, Aljo led us to his art studio located across his family home. 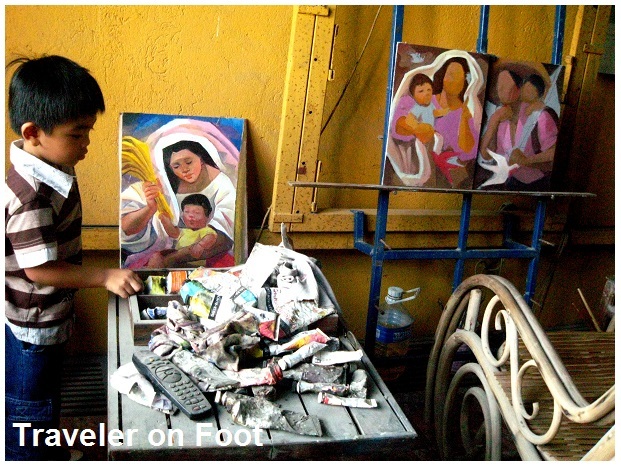 Even before entering the studio, Aljo’s interest in things that tell stories about our local culture is obvious. Inspired by the Ifugao tradition of displaying animal skeleton on houses, the carabao skull near the studio’s entrance was recently acquired from Farmer’s market. 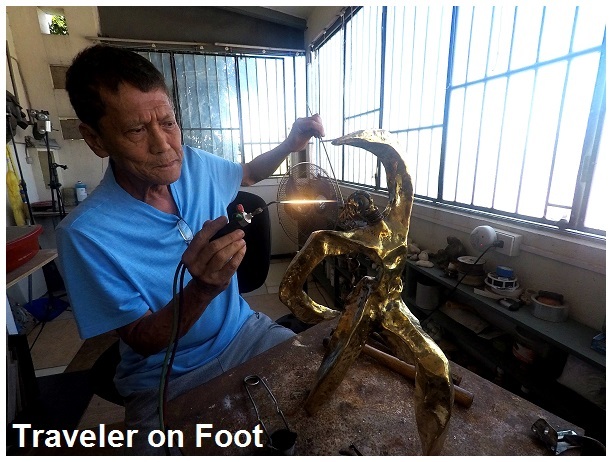 According to Aljo, it took three months for the relic from Cubao to completely dry under the sun before it ended up greeting visitors entering his studio. ARTISTIC ZONE. Music from the opera Cyrano de Belgerac fills the spacious studio. This gives us clues how the artist sets his mood and to what music influences his creative process. Having this spacious studio was a dream come true for Aljo where he spends long hours listening to lively classical music while creating his art. Neatly arranged inside the studio are paint brushes and art books stacked in a corner self. 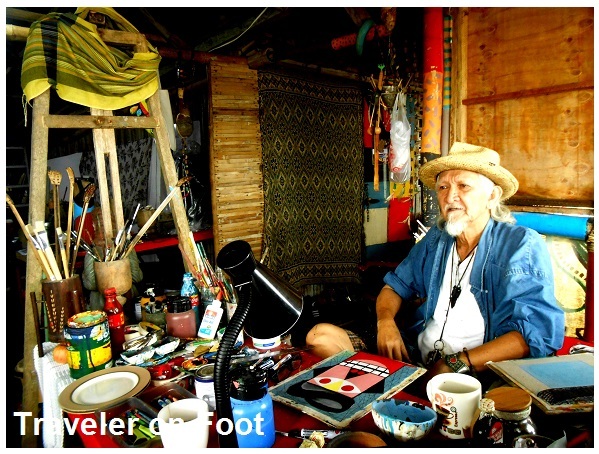 This is unexpected from a prolific contemporary painter like Aljo who admits that he feels uneasy when things are disorganized in his artistic zone. PORTFOLIOS. Aljo showed us photo albums made thick by mini-prints of the his works as a Fine Arts student at the University of Sto. Tomas and photos of his recent works. 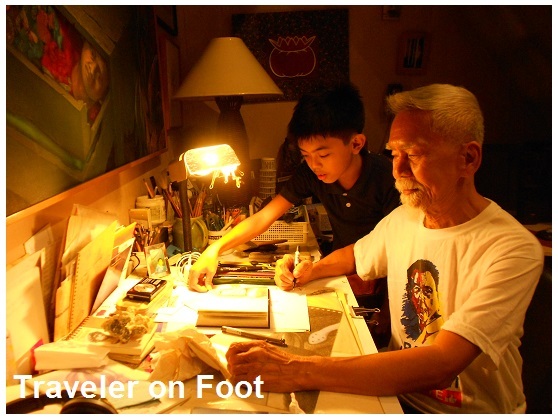 He diligently documents his creations so that he can keep track of his development as an artist. Aljo’s major influences in art were Marc Chagall and Pablo Picasso. He admires the works Alfredo Esquillo and Ronald Ventura. TINTA AT KULAY. Aljo graduated college already supporting a growing family. He worked as a cartoon animator for Toonworks Animation House and accepted commission portraits. 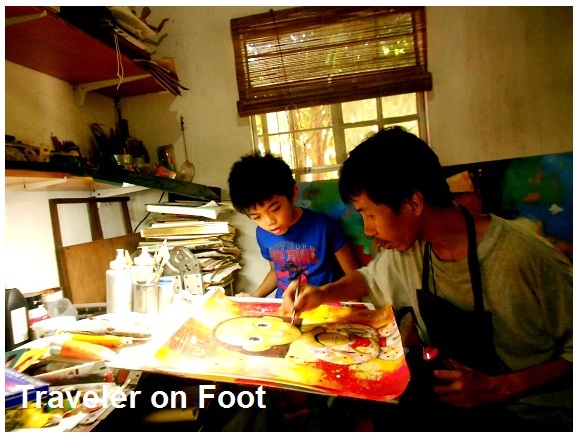 He did portraits for then Executive Secretary Eduardo Ermita and champion swimmer Eric Buhain. His pen and ink were printed on textbooks while his paintings on canvas ended up in stylish homes. Aljo went through the difficult stage in his career when he have to peddled his works. 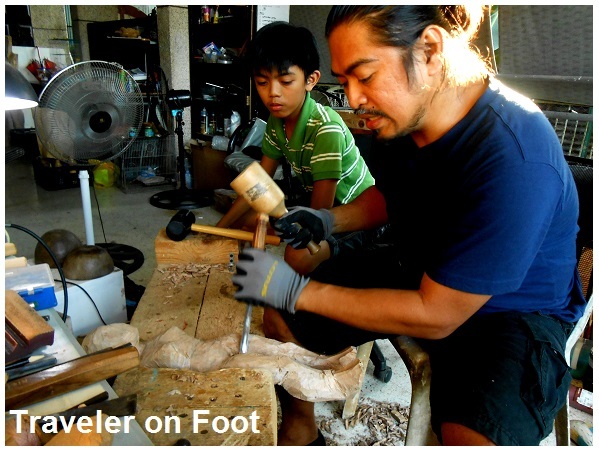 The late Mario Alcantara of Heritage Gallery introduced Aljo to the local gallery scene. In Aljo’s voice: Nabuhay kami ng pamilya ko sa tinta at kulay. ANG PINGOL. 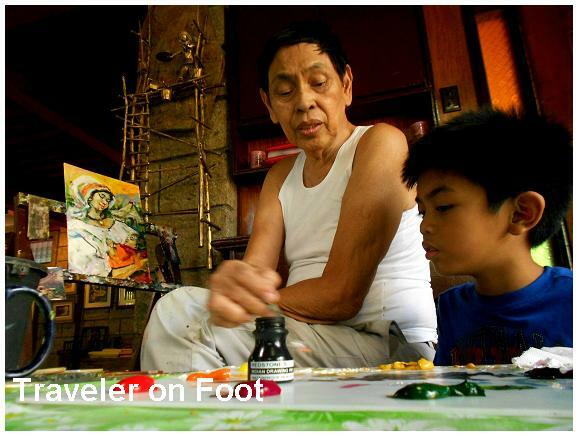 In one occasion, actor Joey De Leon, known for having a massive collection of Ang Kiukok paintings was attracted to Aljo’s artworks while at a mall-based gallery. 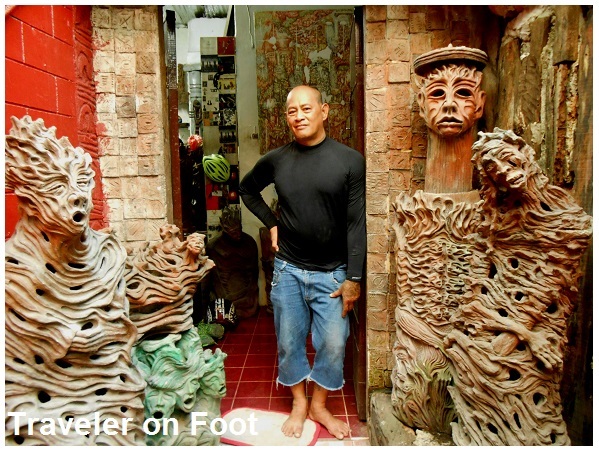 In one of Aljo’s one-man shows, the actor and wife Eileen de Leon showed up revealing to Aljo that their home looks happier because the Pingol paintings that are displayed side-by-side with works of the National Artist. In Joey’s voice: Hindi lang Ang Kiukok meron kami. Meron din kaming Ang Pingol. EPILOGUE. As Aljo speaks animatedly about his personal history, the condition he is going through and the kind of future he envisions, we are drawn to his openness in giving credit to the Divine Art Director as the source of his creative talent. Aljo lets the radio playing as we leave the studio. The strong vibrato and melodious staccato from Cyrano de Belgerac opera spills outside the spacious art studio as if a voice resonating from the Divine Art Director as the Giver of talents and the Maker all things beautiful. 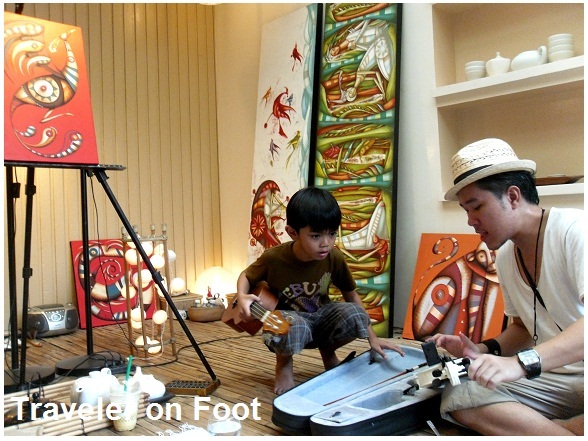 Part of our itinerary when touring around towns and cities is interacting with a local artist in their home studio. Every visit to an artist’s home studio thrills us because aside from spending long hours with our homegrown talents, we get to capture colorful composition set in spaces where they live and create their masterpieces. Nune Alvarado. Painter. Sagay, Negros Occidental. Reodil Geraldo. Sculptor. Talisay, Negros Occidental. Marcelo Jecky Alano, Sculptor. 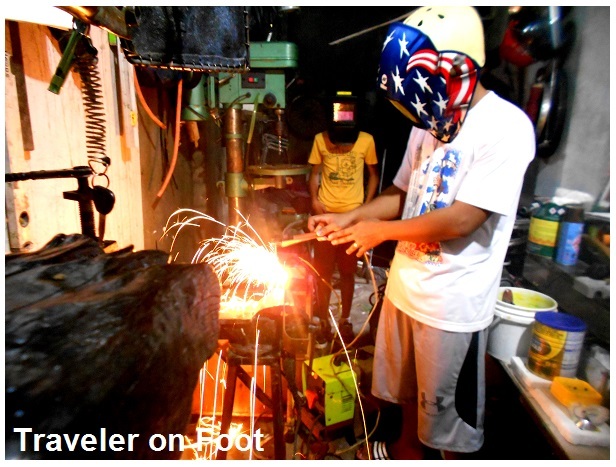 Bacolod, Negros Occidental. Pepot Atienza. Doll maker and book illustrator. Lucban. Benhur Villanueva. Sculpture and art teacher. Baguio. Rafael Paderna. 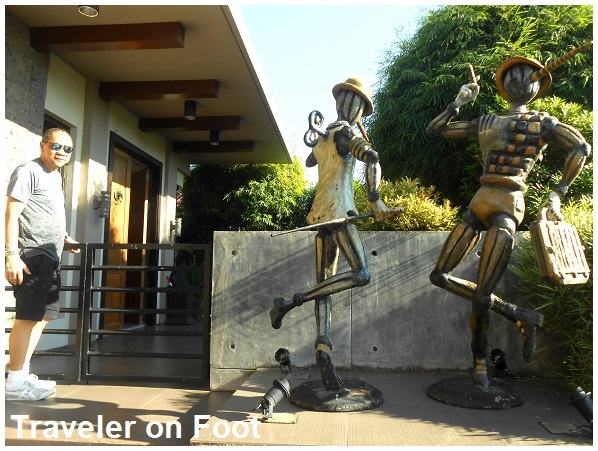 Painter and brass sculptor. Bacolod. Joey Cobcobo. Mixed media artist. Mandaluyong. Leeroy New. Mixed-media sculptor. Quezon City. Lucky Salayog. Mixed-media sculptor. Montalban, Rizal. Neil Pasilan. Mixed-media artist. Mandaluyong City. Raul Lebajo. Painter. Muntinlupa City. Jovan Benito. Painter. Siniloan, Laguna. Jerry Morada. Painter and Sculptor. Siniloan, Laguna. Amador Barquilla. Painter. Mabitac, Laguna. Norma Belleza and Angelito Antonio. Painters. Antipolo. Mario de Rivera. Painter. Mandaluyong. Ferdinand R. Doctolero. Painter. Paranaque City. Rovi Salegumba. Painter. Quezon City. Lydia Velasco. Painter. Marikina City. Luis Ac-ac. Sculptor. Paete Laguna. Ben Dailo. Sculptor. Paete Laguna. Glenn Cagandahan. Sculptor. Paete Laguna. Don Santana. Painter. Pasig City. Paintings and sculptures by Filipino artists Bayani Ray Acala, Richard Arimado, Otep Bañes, Jovan Benito, Christine Cagandahan, Glenn Cagandahan, Odette Cagandahan, Ben Dailo, Carlo Magno, Jerry Morada, Aljo Pingol, Edwin Tres Reyes, Dominic Rubio, and Pancho Villanueva are currently on exhibit for a purpose-driven event in the lakeshore town of Paete. 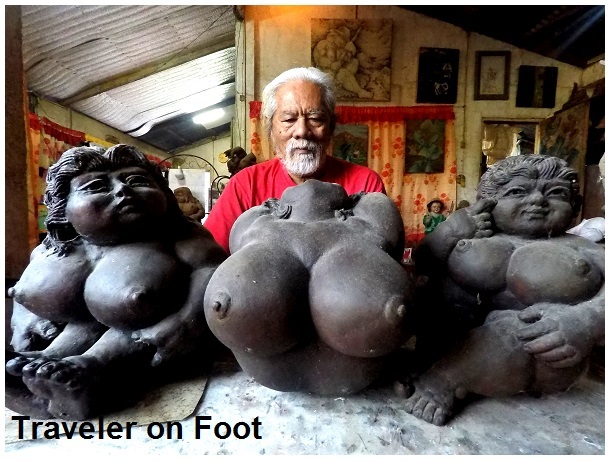 Held on April 4, 2009 at the Shekinah Gallery located along J.P. Rizal Street, Paete, Laguna, the opening program began with a song-prayer led by sculptor Glenn Cagandahan. Shekinah Gallery owner Mary Cagandahan welcomed guests and thanked the Filipino artists who donated their artworks in support of the charity campaign. Among the guests were art enthusiasts, community leaders, and Philippine contemporary art champions, led by guests of honor Galerie Joaquin owner Jack Teotico and Paete mayor Emmanuel Cadayona. Adding caliber to the well-attended evening were Paete maestro Fred Baldemor, Paete Artists Guild President Angelo “Lito” Baldemor, pastor Iris Cagandahan, Former Paete mayor Immo Afurong, Galerie Francesca’s Suzanne Magno, Contemporary Art Philippine managing editor Tara FT Sering, and Kape Kesada owner and founder of Paete Artists Guild Dr. Nilo Valdecantos. Dubbed as Bless the Children, the fundraising campaign is organized by the Lighthouse of Faith, a religious organization based in Paete. All proceed of the art exhibit will go to the organization’s program of providing scholarship for its 300 adopted children. The exhibit runs until May 4, 2009. For inquiries call Shekinah Gallery at 049. 557. 23. 15 or 0922. 833. 88.71.